China has launched into what has been seen by some as "reprehensible and disgraceful bully-boy tactics" following a meeting between the Dalai Lama and the British Prime Minister last month. At least two government ministers have been snubbed on their trips to Beijing recently and there are growing fears that Beijing may target British companies. In the last month Lord Green, the Trade and Investment minister, and Jeremy Browne, the Foreign Office minister, saw planned meetings with Chinese ministers either cancelled or palmed off on junior officials. Lord Green, who was visiting China as the head of a trade mission, was said to have been unable to meet with the Ministry of Commerce or with the powerful National Development and Reform Commission, which sets a course for the country's economy. "What has happened is that things that are normally handled at ministerial level being downgraded or cancelled," one diplomatic source told the Daily Telegraph. "In some cases the Chinese have said it was because of the [Prime Minister's] meeting with the Dalai Lama, at other times they said they were sorry but something had come up," the source added. The recent actions follow on the heels of the cancellation by a senior Chinese leader to Britain in protest of a meeting between David Cameron and the Dalai Lama. Chairman of the Standing Committee of China's National People's Congress, Wu Bangguo had been set to visit Britain at the conclusion of a European tour. However, the visit was cancelled at the last minute in retaliation to the PM's meeting with the spiritual leader. China reacted angrily to the meeting and called on Britain to "stop conniving" with the Dalai Lama, who China sees as disruptive influence and separatist. "We call on the British side to earnestly respond to China's solemn demand, stop conniving at and supporting separatist attempts to achieve Tibetan independence, take practical measures to eliminate the terrible impact and take actions to preserve Chinese-British relations," Beijing said in a statement. The latest salvo has worried some official who fear that the diplomatic skirmish could escalate. "The message has definitely been sent out through the Communist party channels," on source is quoted as saying. "But it is difficult to link any particular negative action directly to the meeting, of course". Meetings between British and Chinese officials are believed to be continuing at a lower level, however, and some significant deals are still being discussed. London is poised to become a major trading hub for the Chinese yuan and a state-owned Chinese power company is bidding to build new nuclear power stations in the UK. But with the Dalai Lama due to return to Britain on Thursday [14th June] for a 10-day, pre-Olympic tour of various British cities tempers amongst Chinese leaders could fray and in turn have a significant effect on Sino-British relations. As China's economy strengthens, there are growing signs that the country is willing to assert itself aggressively. The state-run Global Times newspaper has called for China to suspend all diplomatic relations "for a while" saying that China is now strong enough to bear the economic consequences of freezing relations. "During the Olympics, China should cool down a little bit and we should also slow some cooperative projects between the two countries. This will have a cost to China, but it will have a negative effect on Cameron's government," the paper said. "Chinese is against foreign leaders meeting the Dalai Lama and it has become routine to have a strong response both in trade and politics". Labour MP Fabian Hamilton has expressed his distaste for what he calls China's "bully-boy" tactics, and criticised the Chinese for their threats of economic sanctions and of threatening to pull its athletes out of their Leeds Olympic training camp due to a visit by the Dalai Lama. "To be honest I find it distasteful to say the least that two representatives of a country whose human rights' record is appalling, where freedom of speech is not allowed, where there is no real democracy, come to the city of Leeds and tell our elected officials, people like Keith Wakefield, who is directly elected as a councillor and is leader of the largest group on the council, a very open and democratic system that we have, tells them that they can't do what they think is best for the city, under pain of economic sanction and the withdrawal of tens of, if not hundreds of thousands of [pounds of] investment," Hamilton told the BBC. "I think that is reprehensible and disgraceful." The Dalai Lama is set to share a stage with comedian Russell Brand during a visit to Manchester [Guardian], and tickets to an event in Scotland have already sold out with some being auctioned on eBay for as much as £500 [Scottish Sun]. The spiritual leader is a thorn in the side of the Chinese government, but his popularity outside the country is immense. The Dalai Lama has a significant web presence and has more than 3.6 million followers on his Facebook page and over 4.5 million keep track of his Twitter feed. Even his Google+ account has scored highly with more than 1.8 million having added him to their circles, though his YouTube channel has only a little over 10,000 subscribers. His website is also likely to see a record number of visitors this week as live webcasts of His Holiness the Dalai Lama's talks and teachings from Manchester are broadcast. Those inside China will be excluded from the show since, along with Twitter, Facebook and YouTube, the official Dalai Lama website is blocked by China's government censors. Even after the spiritual leader has left, the showdown between Britain and China will likely continue for some time to come. With the London 2012 games only 43 days away there have been questions raised as to whether the Dalai Lama visit, coming so close to the prestigious event, might draw further protests from Beijing. Asked whether the Dalai Lama's visit to Leeds and other parts of Britain would affect China's participation in the Olympics, the Chinese Foreign Ministry spokesman in Beijing, Liu Weimin, referred to Prime Minister David Cameron's meeting with the Tibetan spiritual leader in May. "We hope the British side stop making mistakes again and again, which undermine China's interests," Liu said. 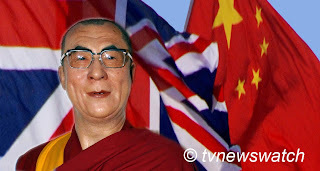 "China-UK relations have been affected by the recent meeting between the British leader and the Dalai Lama. The responsibility lies with the British side." "The Chinese delegation is making preparations for the 2012 Olympics, I think politics and sport should be separated." However, the fact that China had threatened to pull its athletes out of their Leeds Olympic training camp, seems to indicate that politics and sport remain firmly entwined [BBC].